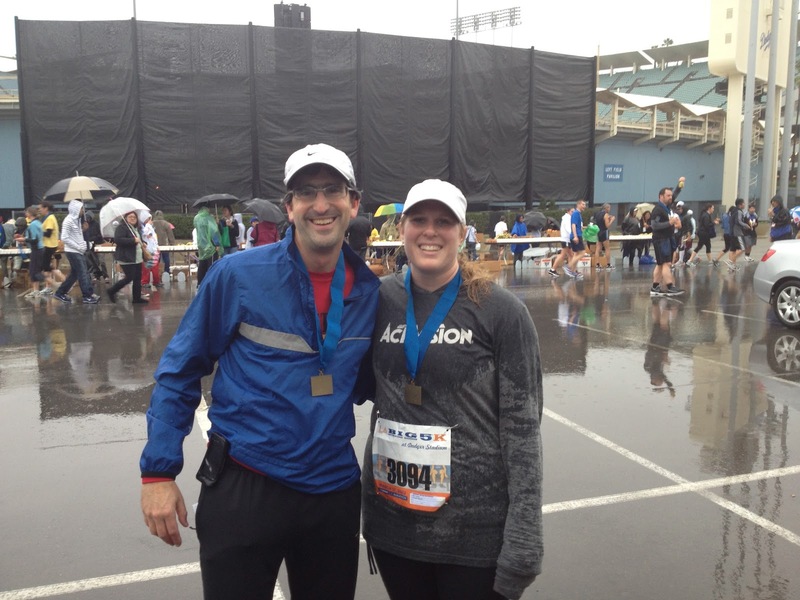 runlairdrun: LA Marathon Update 2: Rain or shine? The big question I have received since sending out my marathon update earlier in the week has been about the weather. After nearly a whole winter without rain, LA got hit this weekend with a storm. As I type this, the sun is clearing around the Palisades even as dusk commences. Does that bode well or ill? The forecast still says "few showers" for tomorrow. Scattered is an improvement on last year's "continuous" actuality. (And of course, we just got a squall as I typed this paragraph.) I don't mind the rain much when running, but the standing waiting in it is lousy. I had a taste of the rainy run this morning of LA Big 5K - a 3.1 mile jaunt around the environs of Dodger Stadium as part of the marathon weekend. I joined a group of runners running for the Alliance of Children's Rights. I mentioned the group in my last email, and I'm excited to say that we've reached last year's $50,000 level. Thanks in part to those of you who have donated this week based on my email, we are in a position to surpass 2011. So, if you haven't had a chance or do not know which charity to support, please pick the Alliance for our final push. https://www.justgive.org/registries/wishlist/donate/runlairdrun. I also had the pleasure to meet Mike whom I have only know via email and Facebook. Mike is from Ohio and is best friends with Activision's SVP of North American Sales, Steve. 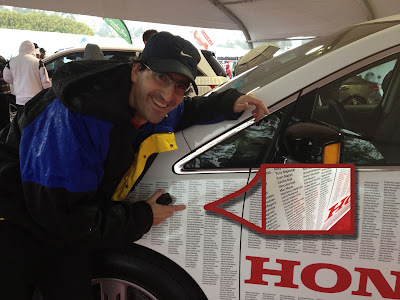 Steve connected us last year when Mike started his running career because he wanted to share some of my running adventures. I am super appreciative, and today I got the chance to see both of them as they ran the 5K. Mike, like me, is running for the Alliance and is also running the full marathon tomorrow. So, we'll be hanging out prior to the event. As I have written before, the LA marathon course is great. Honestly, I was getting very excited during the 5K and then at the expo just thinking about it. I have friends waving hi on the course, and I can already picture myself stepping (splashing?) through the 26 miles from Dodger Stadium to the beach. My goal is then to add in 4 more miles running home for a total of 30. My name on one of two pace cars. I was in about the same spot last year too. None of us can control the weather, so all that is left is to enjoy the rest no matter what happens. Thanks again for your support. The US charities page is here: https://www.justgive.org/registries/wishlist/donate/runlairdrun, and the page for Rays of Sunshine in the UK is now as well: http://www.justgiving.com/runlairdrun. Look for a post race update tomorrow. For those who want during the course action updates, you can follow me by registering here: http://www.xacte.com/templates/lamarathon. My bib number is 679. PS If you actually can control the weather, please dial in a nice mid-50's cool day with minimal breezes. Thanks in advance from all 20,000 LA Marathon runners.